The key to fuelled growth lies in using sophisticated business software in virtually every industry. It is seen as the ideal empowerment where it rids enterprise who are struggling with process bottlenecks and employee productivity issues. Integrated business software suites are essentially transforming how companies function and giving them wings to take their business to the next level of profitable growth. Business software is changing fast, and small businesses can reap the rewards. Cloud technology is making it easier than ever to join together the tools you need. Its termed as customization. 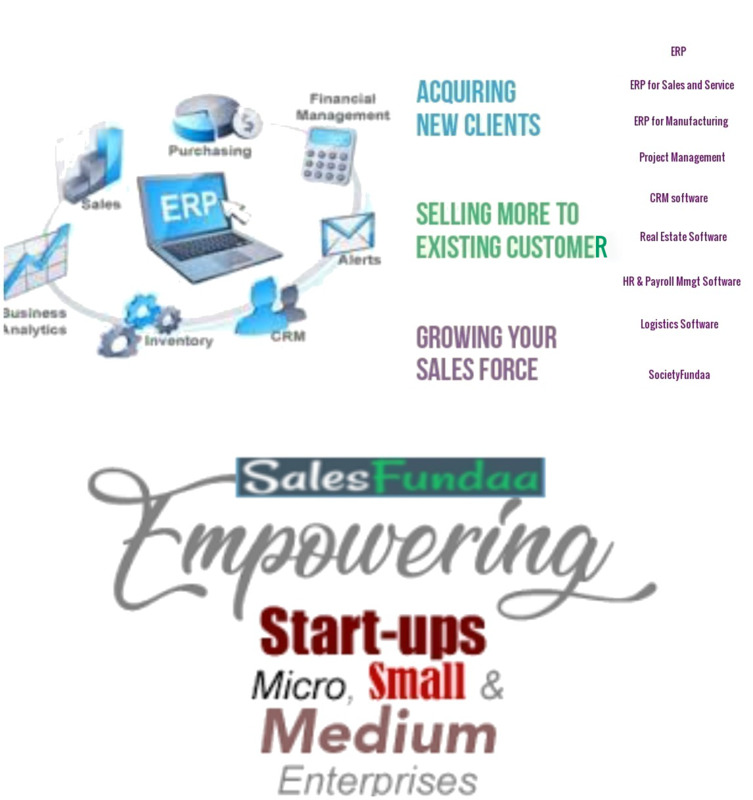 Salesfundaa software solutions has diverse new software modules that can connect together almost like building blocks, sharing data with ease. And since they are often cloud-based they can be accessed from anywhere, not tied to a single desktop computer. They come with GST compliance so you get an automated process in invoicing calculations. Its amazing as they don’t have any extra installation requirement of additional hardware. They can be integrated with tally to save you from additional entries and human errors. They mostly have a user friendly interface which help even not so tech savvy users to use with ease. Data security is of top priority so entrepreneurs are always worried that administrative data should not be visible to all users. Salesfundaa software provides rights that can be assigned so that the data of the concerned departments may be visible only to the people involved there. The advantages are numerous in terms of profitability, productivity and scalability. One needs to use the various modules to experience these advantage. They are available at a very affordable price. This is a very diverse module that can integrate with practically any other module and can scale to any size of business. Multi Department businesses can really benefit from this kind of a software. ERP is extremely profitable for sales and service simply because it gives you features like automated inquiry management and help to automate the whole sales and service process upto marketing scalability with effective marketing campaigns. It enables estimation of individual performances and important features like MIS reporting for valid evaluations of strategy performances in an enterprise. Manufacturers can benefit from ERP software as its diversity and dynamic nature caters to their precise and out of the way requirements. It supports ease of making Bill Of Material (BOM) which is the basic requirement of small scale manufacturers and also it can be customized to meet their ever changing business requirement. Project Management software enables to give estimates of new projects. It is an advantage as an old project already in the software can form a basis to a new estimate. It is the most in thing and most demanded software of today. It provides an automated process and gives the user an advantage of tracking the project progess at different stages. It is the the ultimate technological experience. It is the basic software that is deployed to manage and analyse customer interactions and data throughout the customer life cycle, with the goal of improving customer service relationships and assisting in the customer retention. It is an online real estate software application that manages the overall operational activities and processes, starting from the management of the property, to the management of real estate agencies, agents, clients and financial transactions. Human Resources Software is used by businesses to combine a number of necessary HR functions, such as storing employee data, managing payrolls, recruitment processes, benefits administration and keeping track of attendance records. Biometric integrations have made this software very useful in tracking and maintaining attendance records. The backbone of supply chains is the logistics service industry. Logistics software cover the end to end needs of third party logistics, Freight Forwarders and Parcel/Courier Service Providers who are seeking a high performance logistics service. They assist logistics service providers for supply chain managements with operations with reduced errors and improved efficiency in the SCM process. It is a society management software that is ideal to manage modern societies that are having Resident Welfare Associations . Its high performance is ideal to meet and connect and manage private community networks and keep the members of the society aware of the happenings in a society. There’s more at Salesfundaa Software Solutions. You can call 9235 35 35 35 and ask for a free demo for any of the modules above.